Be the first to share your favorite memory, photo or story of Brenda "Bren". This memorial page is dedicated for family, friends and future generations to celebrate the life of their loved one. 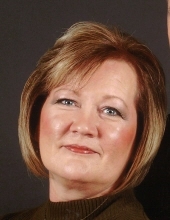 Brenda (Bren) James Balk, of Rogers, entered into the presence of her Savior on Saturday, February 9, 2019. Bren’s body lost the 4 year battle with Pulmonary Fibrosis but her soul won the victory. Bren was born on August 27, 1957 in Bentonville, the daughter of Jesse James and June James McCuistion. She graduated from Bentonville High School in 1975. Bren worked for many years in local government including Benton County where she served as the Director of Emergency Management under County Judge Gary Black. Bren met her husband, Monty Balk, while working for Benton County and they married on February 12,1994. She was a faithful police officer’s wife, best friend, and traveling companion. After retirement, Bren and Monty traveled in their RV until Bren’s illness brought them back home to Rogers. Bren’s joy was her Lord. She was artistic and creative, enjoying Bible journaling, painting and drawing. Bren was a quiet, private lady who loved her children, grandchildren and family beyond measure. She was a member of the Monte Ne Baptist Church of Rogers. Bren was preceded in death by her parents. Left to cherish in memory, is her husband, Monty. Her children, Ryan Neill and wife Tessa of Bentonville, Justin Neil, Jayson Balk and wife Lindsey of Springdale, Kelli Balk Sanders and husband Zbow of Siloam Springs as well as “daughter-in-love” Vanessa Pyle of Rogers. She is survived by 12 grandchildren, Nick, Devon, Logan, Gage, and Noah Neill as well as Addie, Allison, and Aubrey Balk and Hunter, Zoey, and namesake Arrow Bren Sanders. Her 12th grandchild, Chase Balk, is due in May. Also surviving is sister Kathy Rodgers of Bella Vista and brothers Hoyt James of Decatur and Tommy McCuistion of Rogers. To send flowers or a remembrance gift to the family of Brenda "Bren" James Balk, please visit our Tribute Store. "Email Address" would like to share the life celebration of Brenda "Bren" James Balk. Click on the "link" to go to share a favorite memory or leave a condolence message for the family.